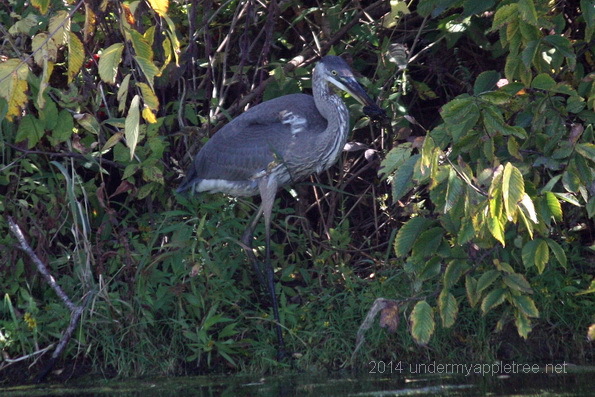 I barely noticed a Great Blue Heron standing at the edge of the pond. They can remain still as a statue while waiting patiently for dinner to swim past. When I saw the bird with his mouth open, I stopped and waited to see if he was going to grab a fish or other small amphibian. This is a young, juvenile heron. The black and white striping on the throat and breast, two-toned dark bill and solid dark crown distinguish it from the adult herons with their black and white striped crown and yellow bill. 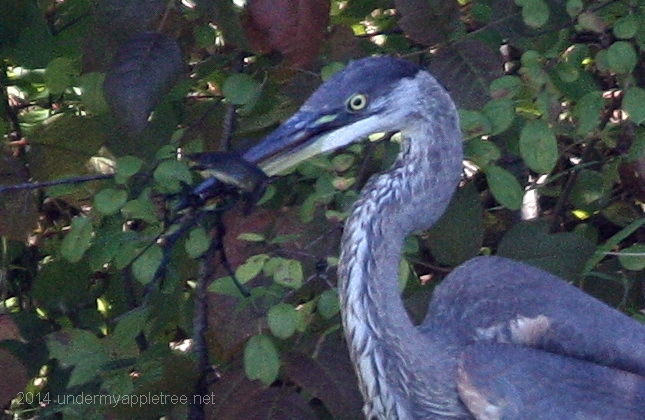 Herons will eat pretty much anything within striking distance, often impaling the prey on their sharp bill. Fish, reptiles, insects and even small mammals or birds are part of their diet. After spearing the fish with his beak, he turned around and began shaking it. This breaks the sharp spines and makes it easier to swallow. After a few minutes of shaking the fish, he gulped it down whole, followed by a drink of water. Wow! 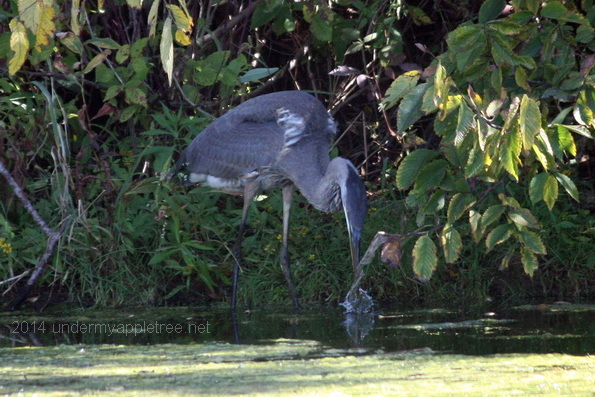 There are herons in the ponds in our neighborhood but I’ve never seen one catch a fish. I love watching herons at work. Your heron looks quite similar to the ones in Europe, but I’m not sure if they’re the same. We don’t see many herons where we live so I really like these photos. Great photos. I didn’t see our heron toady on my walk but often he is there. Very lovely Heron photos, Leslie. I see Herons once in a while (at the park) here. Great pics! We have herons that eat frogs and fish from our pond. The ducks and geese have learned to give them a wide berth. Well, THAT technique makes short order of dinner! Great captures! What great timing to be there when he caught his dinner! I see them around the river near my house occasionally. Great pics, Leslie. Great shots and timing too. Thanks for sharing, have a great week. 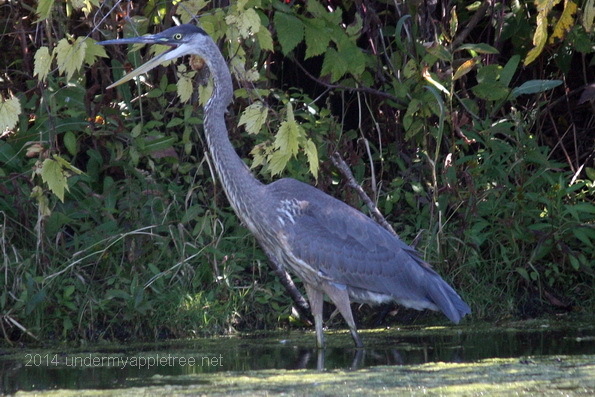 I love blue herons –they are so amazing to watch. Great captures.